This is the first game in the Kid Icarus series. 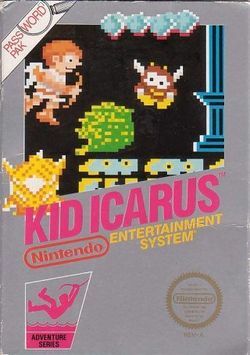 For other games in the series see the Kid Icarus category. Kid Icarus (光神話 パルテナの鏡, Hikari Shinwa: Parutena no Kagami?, Myth of Light: The Mirror of Palutena) is a platform game developed by Nintendo R&D1 and published by Nintendo for the Famicom Disk System in 1986 and the NES in 1987. It was the eleventh best selling Famicom game released in 1986, selling approximately 1,090,000 copies in its lifetime. It is the first game in the Kid Icarus series, the second being Kid Icarus: Of Myths and Monsters. Kid Icarus is often compared to Metroid (which was released the same year), as it uses the same game engine. It even includes a Metroid-like enemy, known as "Komayto". The game manual theorizes that Komayto may have come from another planet. In volume 204 of Nintendo Power, an article was written about the game describing it as blending together elements from The Legend of Zelda, Super Mario Bros., and Metroid, stating that Pit can "jump like Mario, collect items like Link, and shoot enemies like Samus." The original Famicom Disk System versions feature save slots, unlike the North American version which uses a password system (known in-game as "Sacred Words"). As with Metroid, the FDS version of Kid Icarus also features higher-quality music and sound effects that take advantage of the system's additional sound channels. (see below). Kid Icarus was produced by Gunpei Yokoi and the music was composed by Hirokazu Tanaka. The game has been re-released multiple times: in 2004 for the Game Boy Advance as part of the Famicom Mini Series in Japan only, in 2007 on the Wii Virtual Console, in 2012 for the Nintendo 3DS via the Nintendo eShop as part of the 3D Classics series, and in 2013 on the Wii U Virtual Console via the Nintendo eShop. The 3D Classics remake features newly created backgrounds and a more modern save system. Nintendo and select retailers offered a coupon for the game as gift for pre-ordering Kid Icarus: Uprising. In a time where humans and gods coexisted in harmony, the kingdom of Angel Land was ruled by two goddesses, Palutena the Goddess of Light and Medusa the Goddess of Darkness. While Palutena administered the light and helped the mortals cultivate their crops, Medusa despised the mortals and used the darkness to destroy their crops and turn the mortals into stone. Enraged, Palutena transformed Medusa into a hideous monster and banished her into the dark Underworld. But Medusa would not go quietly. She assembled an army of monsters and evil spirits of the underworld to conquer Palutena's home, the Palace in the Sky. War erupted and Medusa's minions overwhelmed Palutena's army, eventually imprisoning the Goddess of Light. Medusa then seized the Three Sacred Treasures—the Mirror Shield, the Arrow of Light, and the Wings of Pegasus—and gave them to her most powerful minions. Defeated and imprisoned, Palutena's only hope was to seek the help of Pit, a young angel trapped in the Underworld. Using the last of her strength, she sent Pit a magical bow. Thus, Pit set out on a quest to escape the Underworld, retrieve the Sacred Treasures that would help him defeat Medusa, and rescue Palutena and restore peace to Angel Land. In the end Pit retrieved these three treasures and battled Medusa. Having won, Pit traveled back to Angel Land to find the newly restored Palutena bestow on him armor (perhaps raising his rank). However, if the secret ending is reached, Pit will be turned older (teenage years) and afterwards receive a kiss of gratitude from Palutena. The controls differ slightly between the Japanese and the North American versions. In the Japanese version, at the Palace in the Sky stage, the player must either hold or tap the A Button repeatedly to make Pit fly, whereas in the North American version, the screen scrolls automatically, thus making Pit fly with the screen automatically as well. Since the Japanese version was released on the Famicom Disk System, some of the sound effects are different than the U.S. version. Most noticeable are the sounds the Grim Reaper makes (he sounds like he's screeching instead of just "blip blup"), the timer sound when players grab a Harp, the noise Pit makes when he's hit by an enemy (a grunt instead of a squeal), and some extra instruments in the music. Also, there are alternate endings between the Japanese version and the North American version. In the North American version, after Medusa is defeated, the player sees a short scene where Palutena thanks Pit and offers him a reward, depending on the player's progress, with the credits following afterward. In the Japanese version, however, the player's reward for beating the game is a picture with Pit standing by Palutena, with Japanese text above the two (in English, it says "Thank you, [file name]! "), and no credits at all. This page was last edited on 26 September 2015, at 17:43. This page has been accessed 97,943 times.